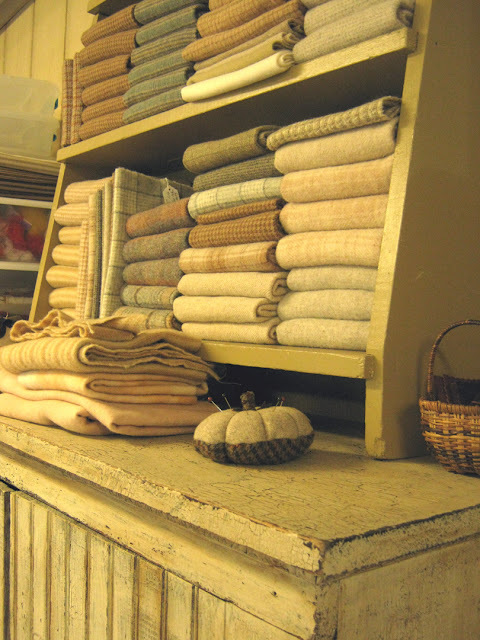 Are your thoughts turning to early Autumn things? 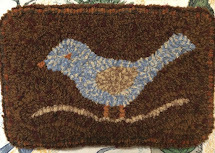 Falling leaves..... golden sunflowers savoring August sunshine with bulky black seedy centers inviting birds to feast! 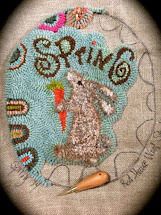 Creativity soars and the spiral of life radiates energy at the highest level as we anticipate the cooler days ahead. I suppose you've all been watching the Olympics! I've caught bits and glimpses of it. I like to catch up on what's happening on the evening news. I marvel at the fit and trim athletes and their intense focus on winning. The gold medal is the highest sought after reward for their hard work. I've been going for a little gold of my own here lately. 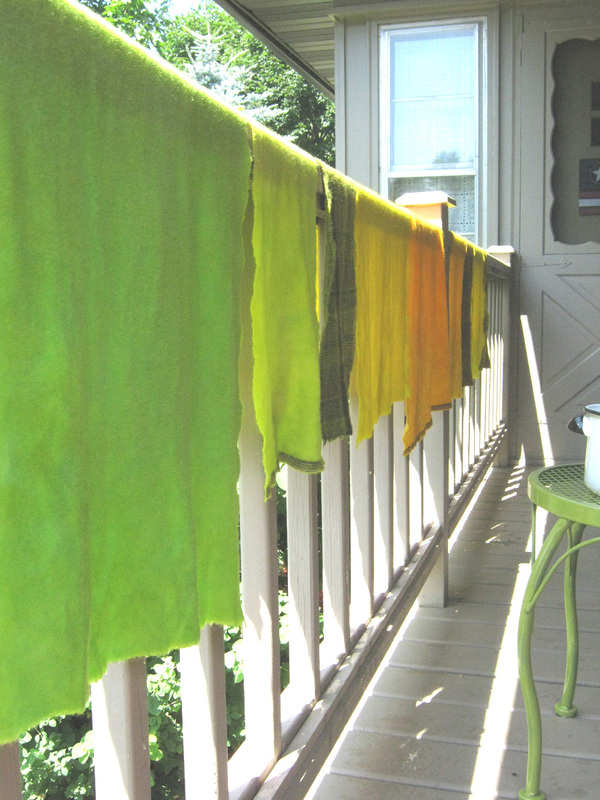 The kind you can only get when wool meets the dye pot and simmers up some of the most luscious gold colors on the planet! My quest for the perfect gold resulted in a few of the pieces you see above. What I'm after is a great sunflower gold! 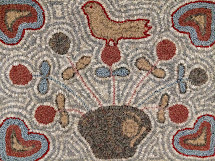 I think a couple of the pieces will be perfect for my next rug design. I hope to begin hooking it shortly so I can show you! I am going a little nutty with the color planning. Sometimes this happens where I can't decide which way to go with a new design. The choices are too wide open. Dark background or light? Expected colors or not? Wide cut or not? All the things one must decide before hooking. This morning after breakfast found me playing in the dye pots again. Guess I got a little carried away with the chartreuse and key lime! Oh well..... Halloween is not that far off! LOL! Seriously though there is a method to my madness! It has to do with my next paper pattern release. 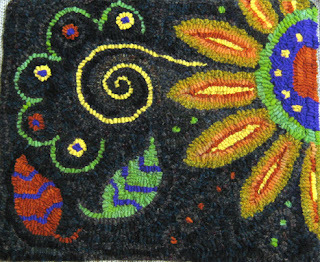 The "Sassy Sunflower" rug which I designed a couple of years ago. The paper patterns will be ready this week if all goes as planned. 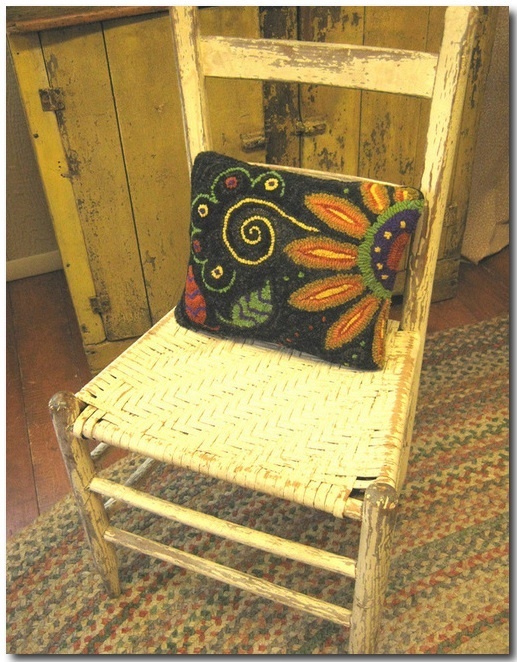 I'll make an announcement here so you know when it's ready and listed on my pattern selling blog. Back to the studio for me! p.s. For you local hookers and you gals from Duluth and Washburn...... If anyone is up to hooking this week I am planning on Thursday August 2nd to meet here at 2:00 pm. The studio has lots of new wool! Hope to see you! The Black-eyed Susan's in my blog header are the ones I purchased out at Saffert's Garden Tour earlier this summer. They are a different variety that have nice big flowers. They have been blooming despite being beaten down a couple of times by driving rain storms. I keep staking them back up and they keep blooming! Kind of like life itself I guess. When we get beaten down with health issues, family struggles, financial worries, weather related problems etc. something seems to always come along and stake us back up. We just have to remember to keep on blooming! The calendar says this Friday is the Primitive Handmades Mercantile update already! I took a break last month so thought I better not be a slacker this month! LOL! The photo above is a sneak peak of one item I'll be offering. A little tease if you will! 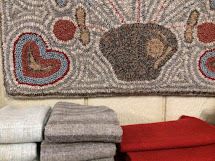 This morning I called in a huge wool order to Rebecca Erb's Wool Studio. Oh My Gosh!..... it's kind of scary to be ordering wool by the bolt ( 15 yards) now as well as yardage! 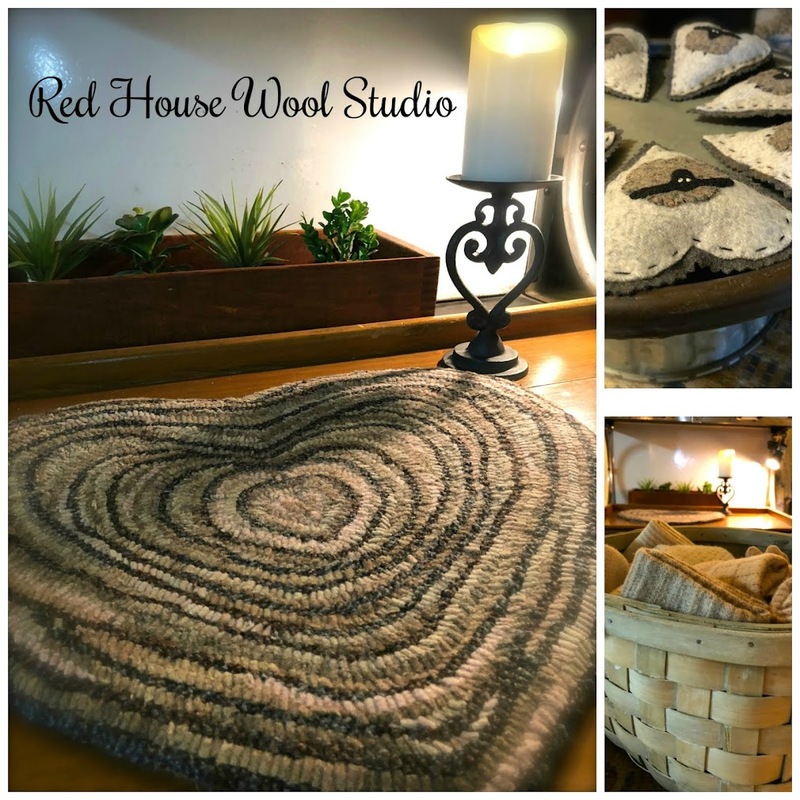 Things have been progressing here to the point that I need wool for my own designing as well as a few students who are looking for wool for their own projects. 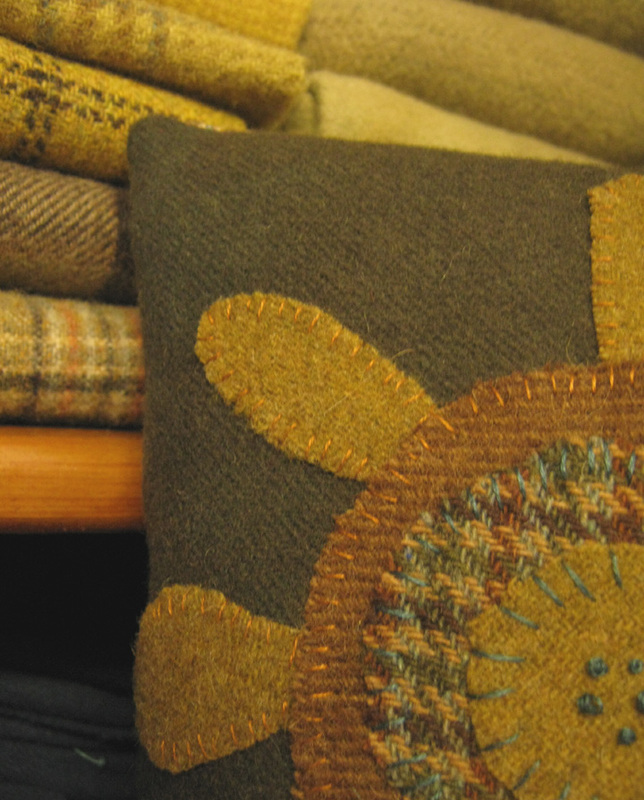 This fall and winter is going to be the busiest ever around here I believe for all things wool and hooking. I'm just gonna keep on blooming! 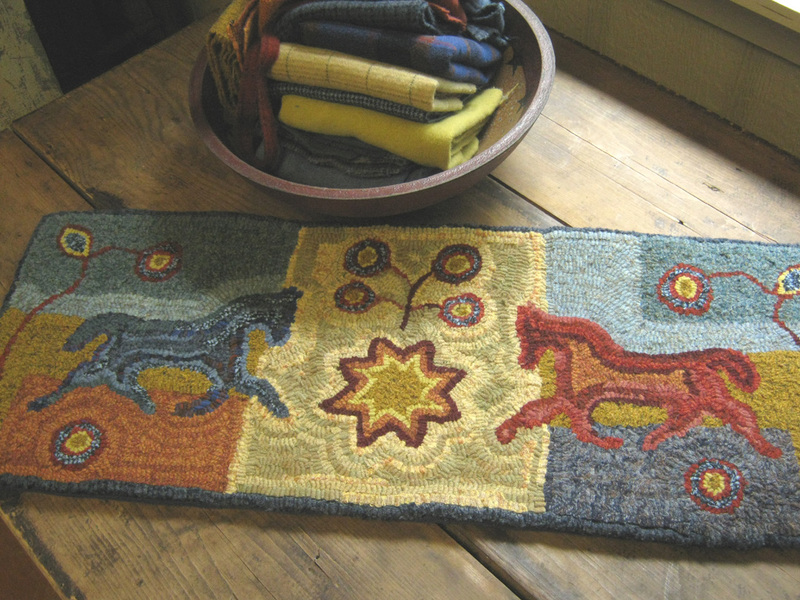 It's a common dilemma among rug hookers to take a decent photo of our hooked rugs. Some days it seems they photograph better than others. 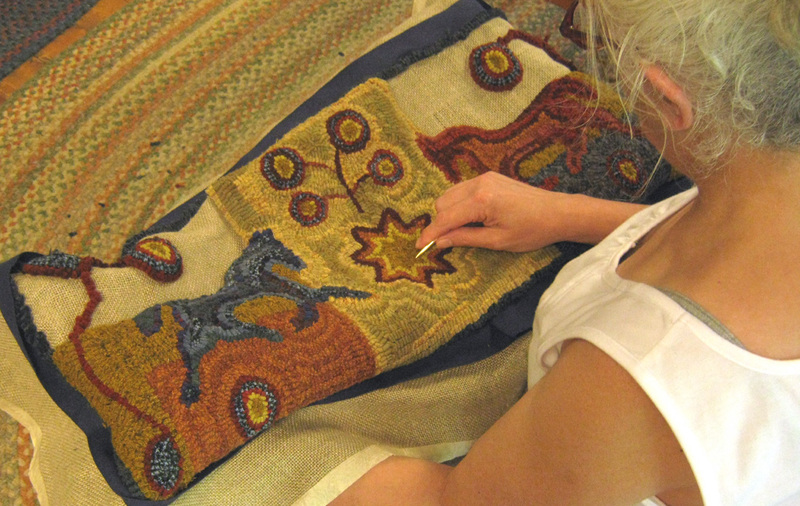 I took some photos today of my completed Wild Horses rug and was hoping for a little better results. All photos were taken indoors with and without a flash. 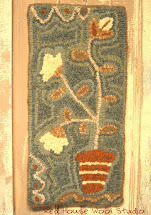 I plan to try again outdoors in the natural light which seems to work better for some rugs. 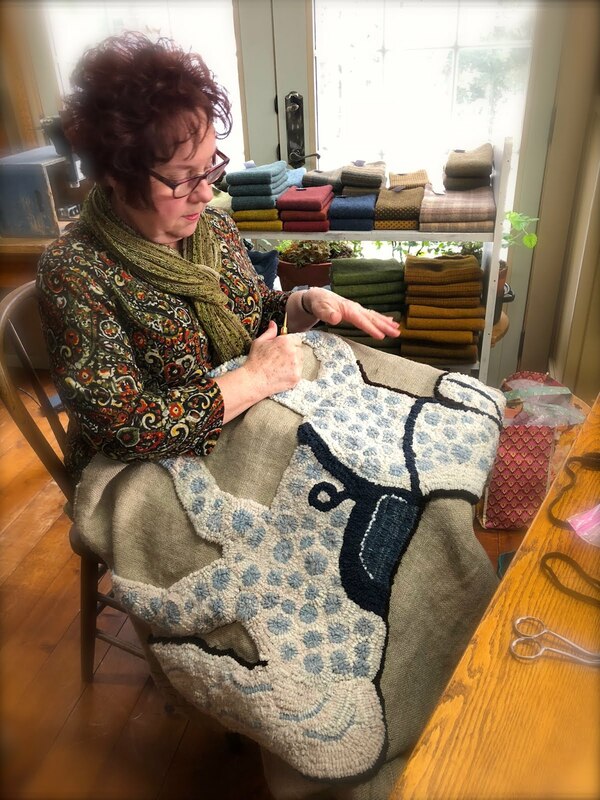 The Lucy Blue wool from Heaven's to Betsy finally arrived and was the perfect blue I needed to finish the background on my Wild Horses rug. It is the wool in the upper left and right corners. 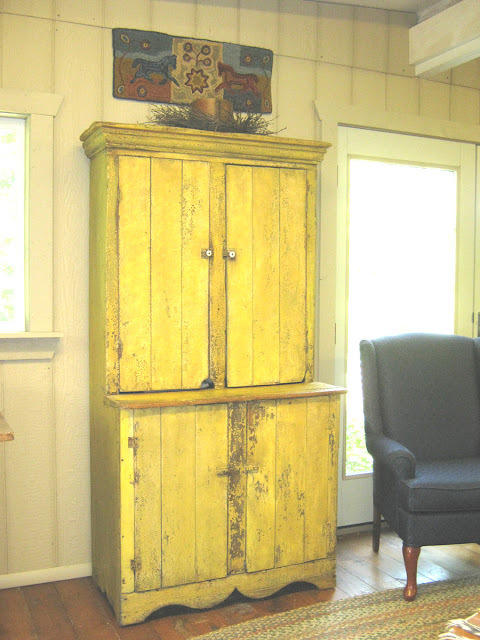 For now I have it displayed above a primitive chartreuse cupboard in the studio. 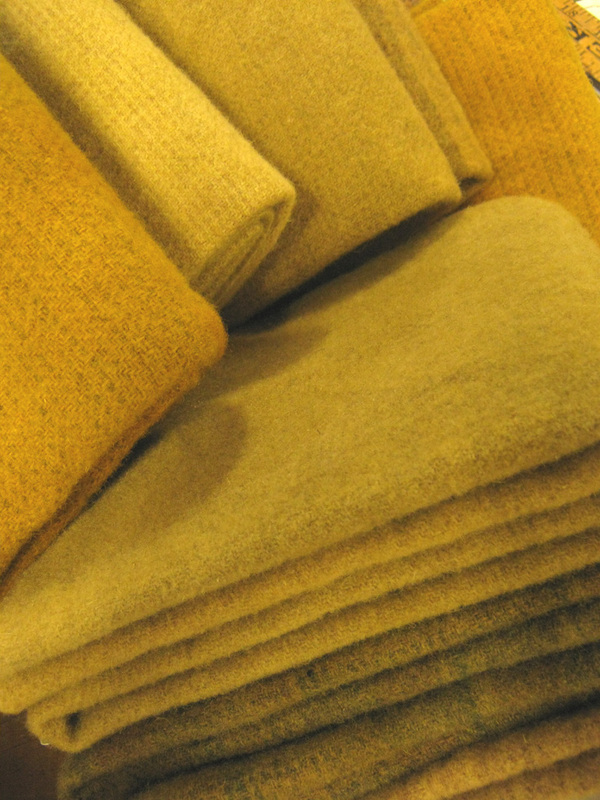 It really picks up the golds in the rugs and some of my favorite wools in the cupboard. As much as I love the vibrant colors there are days I yurn to see only neutrals and soft shades of something. 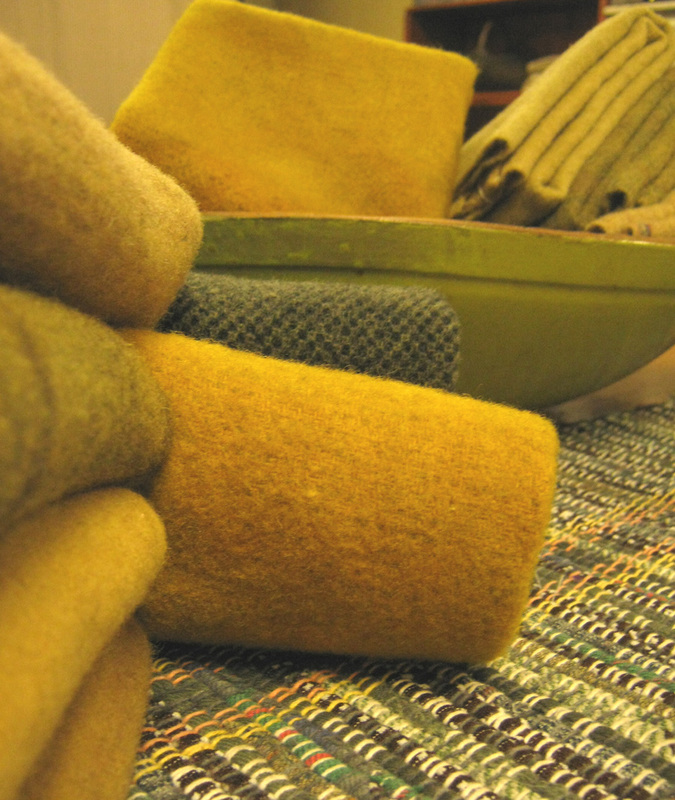 I am working on a collection of neutrals in one area of the studio. Can you tell I'm bound and determined to hook something outside my norm of vibrant colors? I've come to the conclusion that I have to start with a good supply of wools. 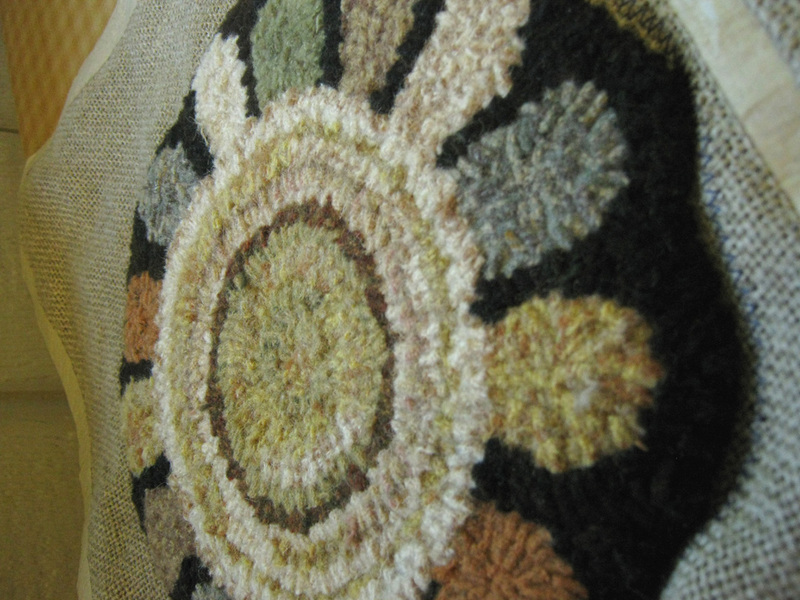 I'm off to the studio to finish some projects, tear and wash some new wools and dream up a new project or two! Wild horses can't keep me from doing what I love!! 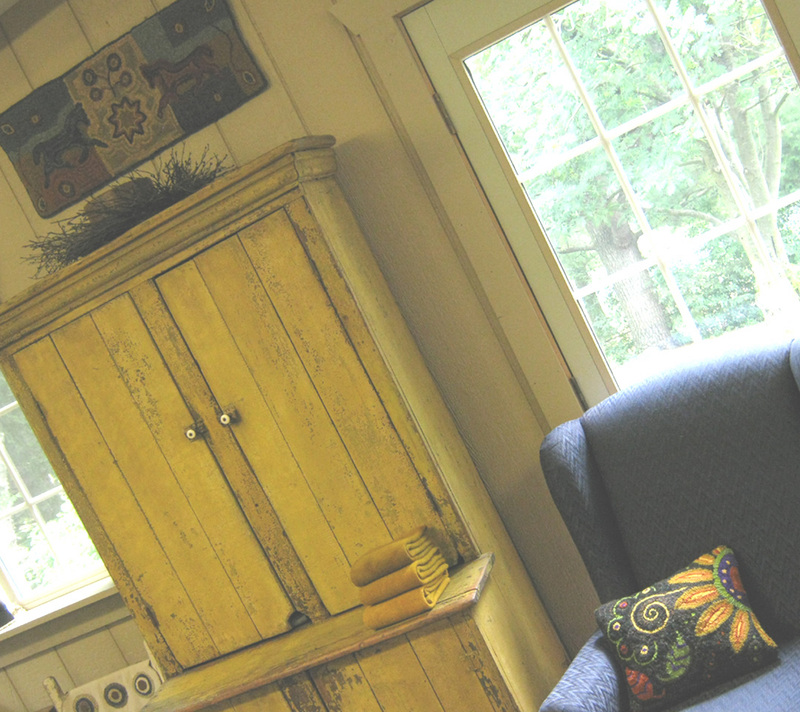 May your weekend be filled with unbridled creativity!! Well, my wool order from Heaven's to Betsy didn't show up yesterday. I was bummed because now I have to wait until Monday to meet Lucy Blue face to face! So being all in the mood to hook something..... anything...... I drew a couple of circles on some linen, closed my eyes and envisioned a sunflower. A little coaster sized mat materialized. 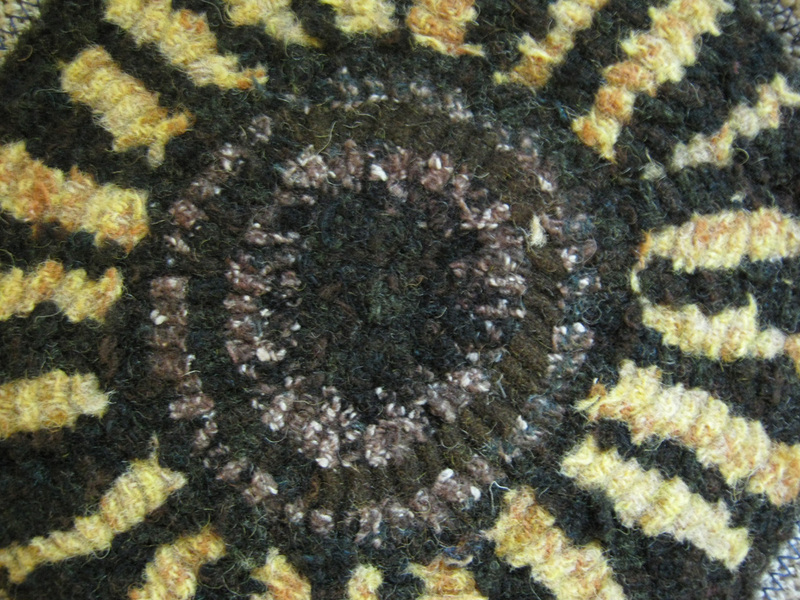 Maybe it looks more like an eyeball than a sunflower? I know.... maybe not what most would consider neutral but I'm working on it. I even decided to get a little funky with this one and put a wavy edge on it. Fun maybe until it comes time to bind it. I don't think it will be too bad though. I should have done the Eaton edge on it but I didn't take the time. 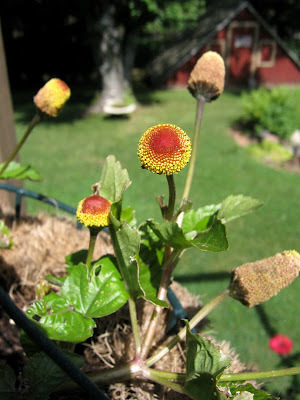 Some of my readers had asked what an Eyeball Plant was from a previous post on the garden tour to the Safferts. Here is a photo of it I took this morning. It isn't doing all that great. Something's eating the leaves which I find strange because if chewed they have numbing qualities. In fact if chewed enough I read they will numb your entire mouth enough to interfere with swallowing etc. Go HERE to read up on them. It's actually the Para Cress plant or some call it the toothache plant. I could have used some of this on my lower extremities these past couple of weeks.... if you know what I mean! LOL! Today is the first day I have actually felt somewhat normal. Now if I can just stay clear of bees and gynecologists for the rest of the summer maybe things will start to look up! 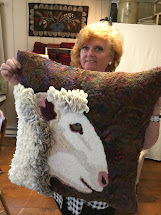 Now if that wool would get here Monday....... there's a couple of wild horses waiting for their background to be hooked! Lucy Blue.... Where are You?!!! 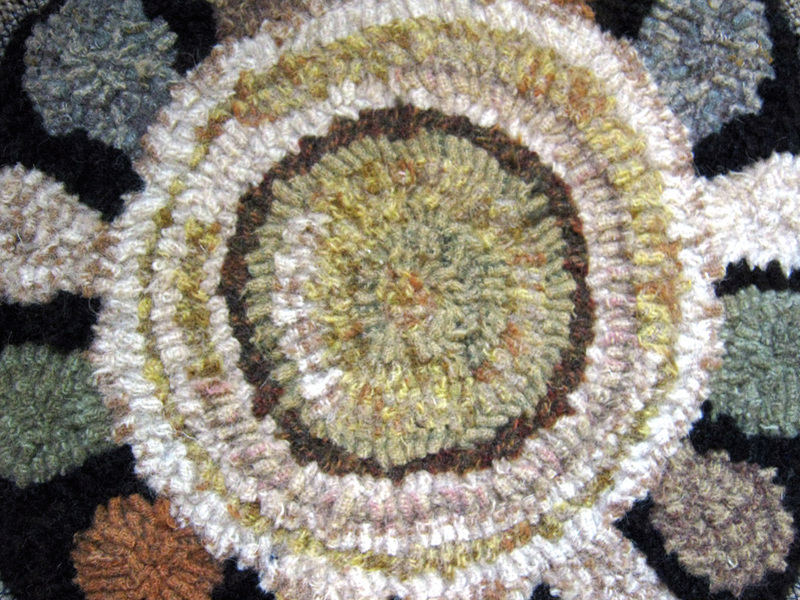 I know it's crazy but after not having a rug on the frame for so long I decided to start one on Monday! 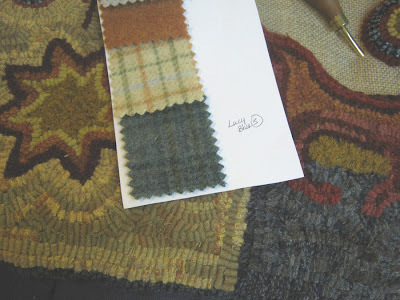 What better way to keep ones mind occupied on something other than the intense heat outside than some intense designing and color planning a new rug( in the AC of course). 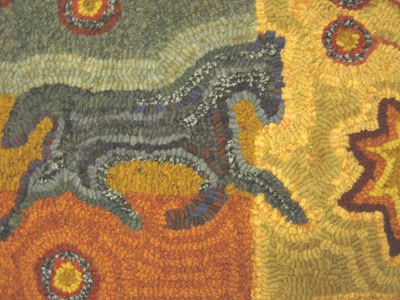 One of my rug hooking students requested a design with horses so this is what I came up with. It is based on an antique rug from the 19th century and is a runner that measures 11 by 30 inches. I also decided to try a new binding method called the Doris Eaton Edge. Maybe you have heard about it and watched the video on You Tube. 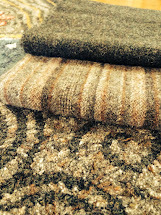 If you haven't well HERE is the link and I suggest you give it a try on your next rug. It is super easy and is a nice looking and durable binding. 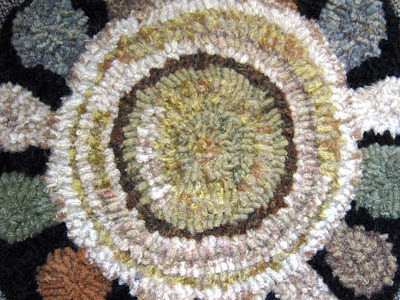 The only draw back that I encountered was having to decide what color I wanted the binding to be before I actually hooked the rug. 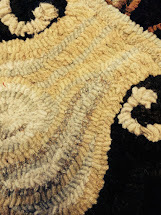 I usually wait until I'm done hooking to make that decision because as you know the color of this type of binding can effect the overall look of the rug. Well not wanting a silly little thing like that stop me from trying this exciting new binding method I forged ahead and made the choice of navy blue. One of the horses in the rug is blue. I still haven't decided on a couple of colors for the background yet. Hence the title of my post.... Lucy Blue.... where are you? 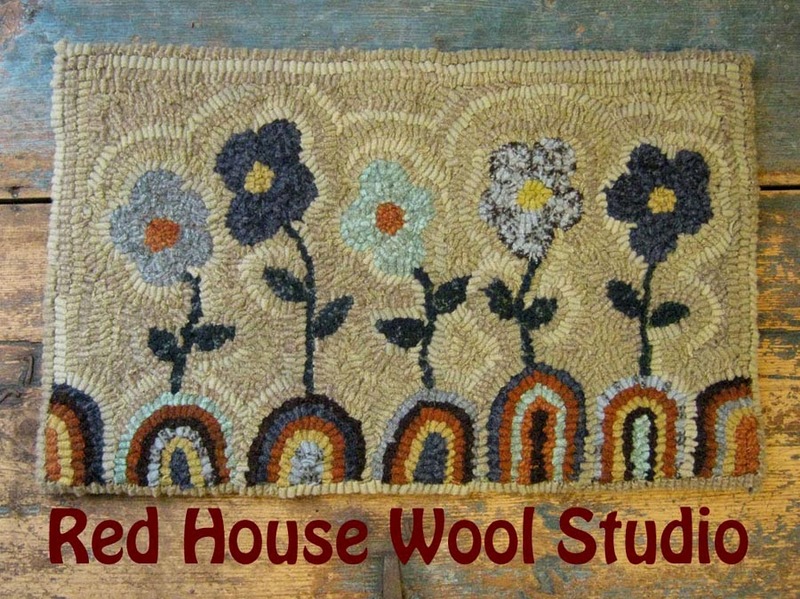 Last Thursday I placed an order for the new wools just released by Heavens To Betsy. One of the wools I ordered is named Lucy Blue. 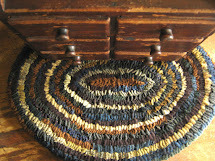 I'm not sure but I think that wool may be the perfect blue for part of the background in this rug. 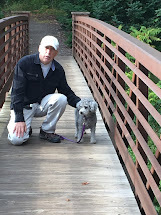 The only problem is Lucy Blue is still making her way here on a truck and is probably spending a hot night or two on the Ohio Turnpike with all the other packages westbound from Claverack, New York! 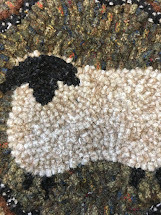 I'm at the point now where I need that wool to decide if it's the right one before I can progress any further on this rug! If you know me..... the hooking maniac from hell ( stayed up til 3:00 am this morning hooking and trying to decide on colors) I'm going crazy not being able to continue because the wool isn't here! Maybe it won't be the blue I'm after but it's really hard to tell from the little 2 inch square of it on the sample sheet. 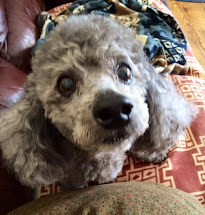 So tomorrow I'll be watching for that UPS truck to pull in the drive-way and hopefully Lucy Blue will be all rested up and ready for her trip through the hot wash cycle in my washing machine. For as quick as you can say Lucy Blue.... where are you?...... I'll be running her through the Townsend!